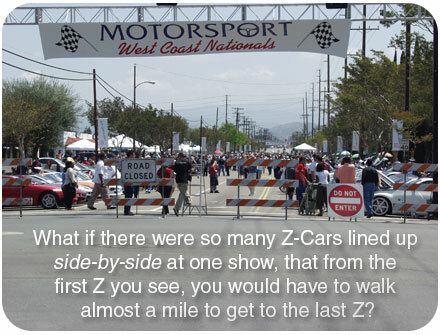 Motorsport Is The Only Source For Z/ZX Parts You'll Ever Need! 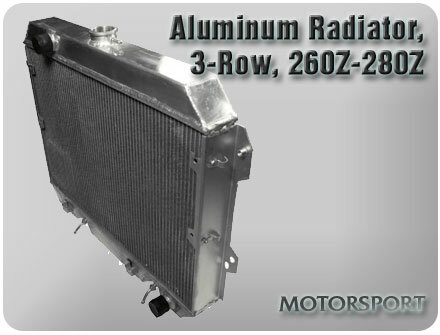 Need parts for a Datsun 240Z, 260Z, 280Z, 280ZX, Nissan 300ZX (Z31 or Z32), Nissan 350Z, or new Nissan 370Z? 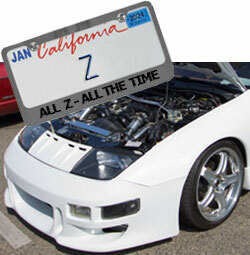 Motorsport is here for your Z/ZX parts needs, and has been for over 28 years! From performance upgrades to stock replacement, from obsolete restoration parts to new technology upgrades, and from accessories to body kits & carbon fiber, our purpose is your project. We believe "Great Service" means offering quality parts and accessories at reasonable prices, and being knowledgeable about what we sell. Then, the only thing better than confidence you'lll get the correct part, is getting it quickly. We have the largest inventory of Z-car parts and accessories this side of Japan. We don't believe in making you wait 4-6 weeks for a "got-to-have-it-now" component. We have the best sources for finding restoration parts when Nissan discontinues them. Our goal will always be to find the part you need, even re-engineering parts whenever we can. 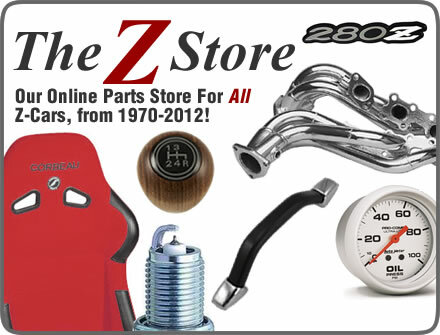 Our online store, TheZStore™, is well over 5000 parts already, and continues to grow. Still, we're as close as your telephone, where a real person, who knows your Nissan or Datsun Z or ZX, can help answer your questions. 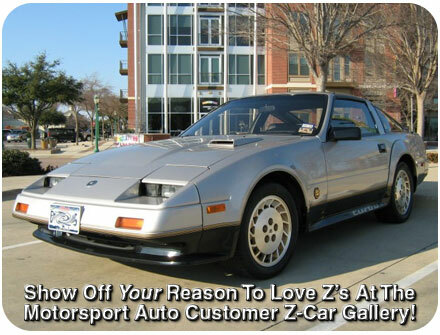 Everything we do is geared to servicing and satisfying you, the Datsun and Nissan Z & ZX enthusiast. Need technical assistance? 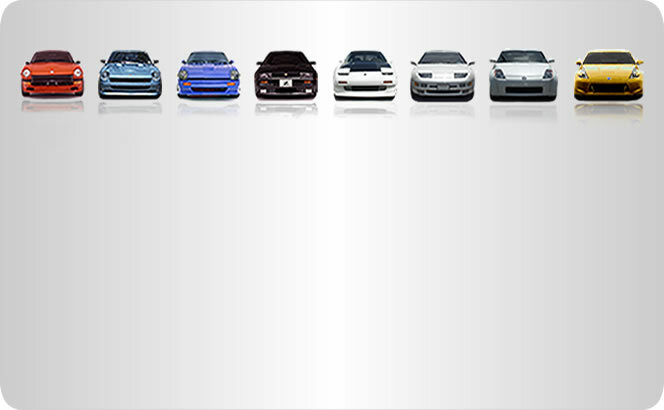 Have a question about your Nissan VG30, VG30T, or VG30TT? Need to know what can be exchanged between a Datsun L24, L26, and an L28? Got a question on how to install your Nissan 300ZX (Z31 or Z32) performance upgrades? Can't get your Datsun 240Z SU carburetors to idle correctly? Need to know how to get vacuum from your Weber triple carburetors? Trying to fix your Fairlady? The MSA Tech Team is as close as your phone or computer. How can we help you? All content Copyright © 1979-Present Motorsport Industries, Inc. All rights reserved. 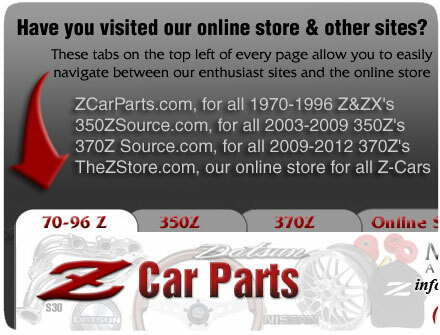 zcarparts.com, 350zsource.com, 370zsource.com, thezstore.com, and others, are divisions of Motorsport Industries, Inc. Nissan, Datsun, and all other manufacturer names mentioned throughout our websites are registered trademarks of their respective companies, and are used solely for descriptive purposes. Some features may require Flash or Java.